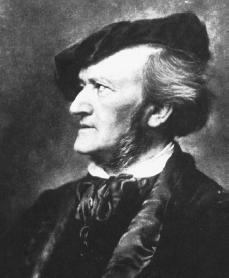 Wilhelm Richard Wagner was born on May 22, 1813, in Leipzig, Germany, into a middle-class family. Raised along with eight siblings, his father, Friedrich, died shortly after Richard's birth, and within the year his mother, Johanna, married Ludwig Geyer. There is still some controversy as to whether or not Geyer, a traveling actor, was Wagner's real father. As a child, Wagner showed little talent or interest in anything except for writing poetry. his early works in imitation of German romantic compositions. Ludwig van Beethoven (1770–1827) was his major idol at this time. Wagner wrote his first opera, Die Feen (The Fairies), in 1833, but it was not produced until after the composer's death. He was music director of the theater in Magdeburg from 1834 to 1836, where his next work, Das Liebesverbot (Forbidden Love), loosely based on William Shakespeare's (1564–1616) Measure for Measure was performed in 1836. That year he married Minna Planner, a singer-actress active in local theatrical life. In 1837 Wagner became the first music director of the theater in Riga, Russia (now the capital of Latvia), where he remained until 1839. He then set out for Paris, France, where he hoped to make his fortune. While in Paris, he developed an intense hatred for French musical culture that lasted the remainder of his life, regardless of how often he attempted to have a Parisian success. It was at this time that Wagner, in financial desperation, sold the scenario for Der fliegende Holländer (The Flying Dutchman) to the Paris Opéra for use by another composer. Wagner later set to music another version of this tale. Wagner returned to Germany, settling in Dresden in 1842, where he was in charge of the music for the court chapel. Rienzi, a grand opera in imitation of the French style, enjoyed a modest success. In 1845 Tannhäuser premiered in Dresden and proved the first undoubted success of Wagner's career. In November of the same year he finished the poem for Lohengrin and began composition early in 1846. While at work on Lohengrin he also made plans for his tetralogy (a series of four dramas), Der Ring des Nibelungen (The Ring of the Nibelungen), being captivated by Norse sagas. In 1845 he prepared the scenario for the first drama of the tetralogy to be written, Siegfried's Tod (Siegfried's Death), which later became Die Götterdämmerung (The Twilight of the Gods). Wagner had to flee Dresden in 1849 in the aftermath of the Revolution of 1848, which resulted in an unsuccessful uprising against the German monarchy or king. He settled in Switzerland, first in Zurich and then near Lucerne. He remained in Switzerland for the most part for the next fifteen years without steady employment, banished from Germany and forbidden access to German theatrical life. During this time he worked on the Ring —this dominated his creative life over the next two decades. The first production of Lohengrin took place in Weimar under Franz Liszt's (1881–1886) direction in 1850 (Wagner was not to see Lohengrin until 1861). The year 1850 also saw publication of one of Wagner's most vulgar tracts, The Jew in Music, in which he viciously attacked the very existence of Jewish composers and musicians, particularly in German society. In 1853 Wagner formally began composition on the Rheingold; he completed the scoring the following year and then began serious work on the Walküre, which was finished in 1856. At this time he was toying with the notion of writing the drama Tristan and Isolde. In 1857 he finished the composition of Act II of Siegfried and gave himself over entirely to Tristan. This work was completed in 1859, but it was mounted in Munich only in 1865. In 1860 Wagner received permission to reenter Germany except for Saxony, an area in eastern Germany. He was granted full amnesty (political freedom) in 1862. That year he began the music for Die Meistersinger von Nürnberg (The Mastersingers of Nuremburg), which he had first thought of in 1845. The Meistersinger was completed in 1867; the first performance took place in Munich the following year. Only then did he pick up the threads of the Ring and resume work on Act III of Siegfried, which was finished in September 1869, a month that also saw the first performance of the Rheingold. He wrote the music for Götterdämmerung from 1869 to 1874. The first entire Ring cycle ( Rheingold, Walküre, Siegfried, and Götterdämmerung ) was given at the Festspielhaus, the shrine Wagner built for himself at Bayreuth, in 1876, over thirty years after the idea for it had first come to mind. He finished Parsifal, his final drama, in 1882. Wagner died on February 13, 1883, in Venice, Italy, and was buried at Bayreuth. Gutman, Robert W. Richard Wagner: The Man, His Mind, and His Music. New York: Harcourt, Brace & World, 1968. Reprint, San Diego: Harcourt Brace Jovanovich, 1990. Magee, Bryan. The Tristan Chord: Wagner and Philosophy. New York: Metropolitan Books, 2001. Newman, Ernest. Wagner as Man and Artist. New York: Vintage Books, 1960.
awsome i got everything i needed for my project. Thanks for your help.